Their wedding date is set! When did you know that he was the one? I knew when I got to ride/drive tractor with him. We can talk about anything and always find something to laugh about. What is your favorite thing about them? His smile and he's always there when I need him. Congrats on your engagement Doug and Katie! We're so happy for you! She's back to her roots. The story actually begins in late 2013. I’m an Iowa farm girl who had gone away to college and been pretty removed from the farm scene. On weekends, I would come home and go to farm auctions with my father, but it wasn’t where I was looking for dates. I dated city folk. Guys with office jobs. Guys that never could understand the trials and tribulations of farm life. That was okay with me. Or so I thought. After college, I took a job selling cheese with a company based out of Wisconsin. My territory was in Iowa so I stuck pretty close to home. One day, a competing sales representative from another company bumped into me at a store. He told me that it’s hard for him to sell against me (probably just a pick up line) because I was so good at what I did. He asked if I wanted to go out. I agreed and off we went. As we are sitting there talking at dinner, I could tell he really wasn’t my type. He was lacking the morals and the character I was seeking in a partner. He was a nice enough guy, but not my style. Back then it seemed like you could see some profiles without being a member. I’m not sure if that has changed now, but anyway, there were some good looking men on there! I played around with it for a while and eventually a few months later, I signed up for a membership. What struck me right away is that I was talking with guys on the site who seemed to have morals, character, and were different from what I had been finding. I started communicating with a guy a few miles away from where I was living. I figured my parents would really love this guy! We went out to a restaurant a few weeks later. He was a really nice guy, but so painfully boring. He basically listed all his assets as we sat there talking. It was like, “I have 40 head of beef cattle, 5 hay wagons, 7 tractors….” It went on and on. I think I actually yawned. Yes, he was nice and seemed to be a decent person, but at what cost? I began to wonder if this online dating thing was for me. As I drove the few miles home from the restaurant, there was a full moon. Where was the guy that was under that same moon who was looking for me? I was having a little pity party thinking maybe online dating doesn’t work. Maybe meeting someone in person is a better indicator if they are super boring. You can’t figure that out over a computer! Furthermore, I have always been extremely picky in my dating life. I started to think even online dating couldn't bring me a guy that would be able to check the boxes of my (nearly) impossible high standards. I got home that night and saw a message on Farmersonly. It was a guy from Wisconsin, named Matt. I’ve always been an Iowa girl and planned on staying that way, but the border to WI isn’t too far from NE Iowa, so I figured it might be okay to check it out. Other guys from far away states I had told a flat NO because I wasn’t going to move that far. This particular guy intrigued me. We had a few message exchanges over the next few days and then I told him plainly that I didn’t want to write messages back and forth only to meet and not be interested. My philosophy was that we should just meet in person and decide if we liked each other at all, otherwise we should move on. I thought that would be better than that last date that I had put a lot of time and energy into communicating only to not like him in person. This guy totally agreed. We set a date. He asked what type of food I liked and I said Italian. I figured that if I didn’t like him, at least I’d get an Italian dinner out of the deal! My only gripe is that since I was looking in a range of under 300 miles away, I guess I hadn’t realized this guy was so far away. We were 250 miles, or 4.5 hours apart. We met in the middle for our date so we both drove a couple of hours to meet at a restaurant. I was there first. I had left too early. He came right at 2pm, which I didn’t really like. I thought for an important event like this, the guy should have left plenty of time! After all, he was meeting me! He drove an older, sensible car. I liked that. I hoped he was a frugal person. He was tall and broad and I liked his build. We had an awkward moment when he tried to hug me to say hello and I tried to shake his hand. I explained later I just don’t really want anyone getting that close and personal when I don’t know them! He understood but said from our few exchanges he felt like he really liked me and he didn’t think a hug was out of line. Anyway, we sat there, ate, and talked. He asked good questions and he seemed to be a really genuine person. We started to talk about what we did for work. He explained that besides dairy farming with his dad, he works off the farm. All I knew is that he had listed “retail” as his job. As we talked, I discovered he worked at a grocery store, where they sold WI cheese, of course, and he knew some of the people from my company. It was one of those moments where my ears really perked up because he understood my world. We talked about everything from religion to families to everything in between. After sitting at the restaurant for 5-6 hours, we decided to have a change of scenery, so we went out for frozen yogurt and talked more. We ended up sitting in his car around midnight still talking. I think we would have talked longer, but he had a contractor coming early in the morning to do work in their dairy barn and he still had over 2 hours to drive home. It was one of those moments in life you won’t forget. I felt safe with him, I felt comfortable, and I felt at home. We hugged and had a long goodbye next to my car door. We both lingered and it was obvious we didn’t want to leave. I was fine with hugging him then! I looked up at the moon as we hugged. There was a guy under the same moon looking for me. And here he was. We have the same life goals and we look forward to raising our family on his family’s farm. It’s not just an occupation, but a lifestyle and we both understood that from day one. The next weeks after meeting brought long phone conversations that lasted into the wee hours of the morning. We would talk for five or six or more hours at a time. Our record was a nine hour phone conversation lasting from 7pm-4am. Hearing all of that, one might ask what took us so long to get married. In a short answer, the distance. I have known for a long time that this was the man I wanted to be with, but it’s been difficult to leave my home state. My parents would have just as soon seen me marry Mr. Boring than leave the state of Iowa. But sometimes, you have to follow what you know is best for you. We will be getting married in Iowa (of course) on September 30, 2017. 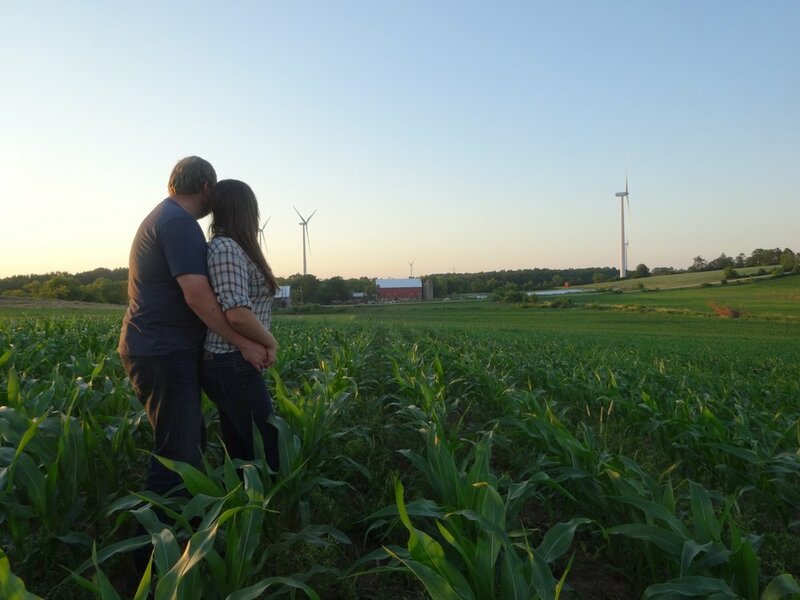 Our wedding invitations even include a picture of our future farm. And now that I know what Farmersonly is, I recommend it to everyone I know!